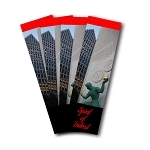 Full color bookmarks printed on both sides for double the impact. Ultra Glossy UV coating or aqueous coating available. Always printed on brilliant white, 14pt ultra-thick stock.